The Christmas holidays are nearly upon us and parents, teachers and school staff are no doubt looking forward to the last day of term and a well earned break. It can be bit different for some parents, though, especially if they are raising a child with autism. Along with birthdays, Christmas frequently ranks in the top 10 most stressful times for parents. The 24/7 part of being a parent is there, but in addition there are all the expectations that come with the festive season. Here I focus on what potential problems might occur and offer some practical tips on how to overcome them, starting with The Christmas period overall and Christmas Shopping. These will be followed by Presents, Wrapping and Crackers, and then Celebrations and Food. Wrapped up together, Christmas and autism – can be a tricky mix as there are so many social aspects to the celebrations and shared family times. The media and advertisers promote a powerful picture of what family Christmas’s are like (or should be like!). As parents, we then carry expectations of what we can provide, share and plant as memories for our children. Parents with autistic children want to manage Christmas, for all to enjoy it and for their children to be a part of the celebrations, but thoughts can be tinged with anxiety and dread, particularly if there were problematic times last Christmas. Think through the days leading up to Christmas and the days of celebration themselves – and then sort out what is planned or expected into these groups to manage them more effectively. 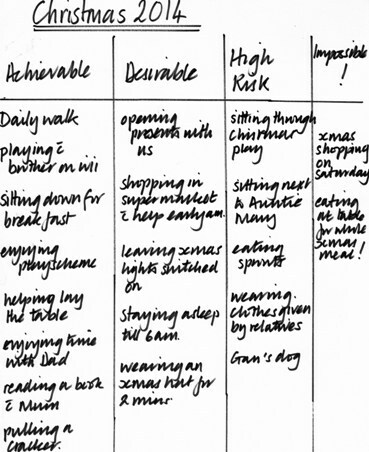 If you manage 80% of the achievable, one or two things in the desirable column and manage damage limitation for everything in the high risk column you will have done an amazing job and supported your child in enjoying the bits of Christmas that work for them. Enjoy the bits that work well, admire the things that are hard for you and the child and recognise that some things are just too hard at the moment but maybe they will make it onto the desirable list next year with practice in the intervening months. We are heading for stress and anxiety if 100% is expected, for not even families without autistic children involved achieve that! Instead, break out the medals for 80% and stay doable and practical. As I stood in a queue recently in a very full shop I began to wonder, how do small children manage this? The bags other people are carrying bump into them, the shelves are overflowing with goodies and there are extra bins of toys they must not touch or take filling the aisles. There are sparkling flashing decorations everywhere and Christmas music occasionally interrupted with staff announcements. Some clearly did cope because they were engaging and interacting with their parents, and being tempted with promises of what they might receive on Christmas day if they were good. Christmas shopping is bound to be much harder for children with autism as these routes to self-occupation and staying engaged just don’t work as well. The whole scenario becomes higher risk, particularly as autistic children can be over stimulated by sounds and lights and the hustle and bustle of crowds – it is easy to see how a child’s behaviour goes off the rails and problems occur. Whilst we do want our children to be a part of their community and get out and about, it’s only natural not to want to repeat difficult and stressful experiences for the child and everyone else! By understanding Christmas shopping from the autistic child’s point of view, with some planning shopping becomes something that is do-able for a bit and can be practiced for the future. It helps to think in very practical ways; it’s unlikely to be perfect but if they make the shopping do-able and lower in stress levels, you are getting there. For example, if your child finds bright lights difficult would wearing sun glasses help? Would headphones help to cut out some of the sounds and noise? Would a hood on a jacket or sweatshirt pulled up mean a bit of the crowd could be shut off from view? Would a cap worn pulled down help shut out some of the flashing lights or people? Would a rain cover pulled over with a dark shawl draped on top help produce a safe and calm place inside a buggy for toddlers and small children? Is there a calm and quiet place you could bolt to in the shop if things get tricky? Would shopping with your partner mean that one could be in the shop whilst the other walked round the block with the child and you could meet up to swap roles using mobile phones to coordinate things? Would shopping as the shops opened or last thing before they shut mean there were fewer people around? Would shopping with a list help you to stay focused and get things done faster? Would pre-packed small portions of snacks the child will eat help you manage when things were getting challenging? Recognise when things are just too hard, such as a major food shop that is going to take ages. And get help so you can leave your child with someone else or shop at night when you have someone at home to babysit! You don’t have to be super human, keep it simple practical and do-able! We enjoy buying and giving presents, especially for our children, and we love the thought that they will like them and have fun playing with or using them. Sometimes they may be more interested in the cardboard box, of course, than the gift itself! The giving of Christmas presents can be far more complicated for an autistic child as they may not be interested in standard toys or maybe have difficulty understanding what unwrapping is all about. Or they might find sharing problematic and understanding that not all of the presents under the tree are for them. There are so many unwritten rules about presents and behaviour that is expected. Many of these rules involve social understanding and communication if they are to be understood. Parents are often asked by relatives and friends what their children would like for Christmas; unfortunately there is not always an easy answer if a child has no or little interest in typical toys. Perhaps you could suggest something that is small and inexpensive so the giver can have the fun of giving a present but ask that any money left over is available towards a play-scheme or time with a favourite babysitter. Most people are more than happy to do this if they are aware that this would make the child happy – but it does mean you have got to be quite clear. Some autistic children find wrapping paper highly confusing. For example, they might think that the pictures on the paper reflect what is inside and if they don’t want the snowman pictured they will refuse to open the present or get upset. For these children,plain wrapping paper and a clear picture of the contents stuck on the outside removes the uncertainty and that lowers the stress. Another trick is to wrap presents in cellophane, meaning there is still unwrapping to do but anxiety about what is inside is totally removed and the child can relax and enjoy the gift. This may seem unusual, but if the traditional ‘surprise’ element is causing the child to worry then really the surprise part is not worth the stress! It can be the case that one present that completely satisfies the child’s interests for that day is enough. If you know this is likely to happen perhaps plan for the others can be put away to open on another day or perhaps a sibling can open them for their brother or sister and say the thank yous! Presents can be complicated things, the important thing is to have a go , there’s always next year to take the next step forward in the skills needed. 4. Christmas wrapping/hats/crackers and other delights! The secret to these Christmas traditions, if your child is uncertain about them, is practice, and this needs to be done little and often before Christmas day. In the specialist nursery we would play games wrapping things up in old bits of wrapping paper. For example, at snack time we would sometimes wrap up a biscuit or fruit in a corner of wrapping paper, just folding it up and not using tape, and announce joyfully ‘Happy Christmas’ as we handed it over. In doing so, children became used to opening paper and finding something inside. There was never anything especially important in the wrapping, it was simply about playfully practicing the routines.playing Christmas wrapping games We did the same thing with crackers using the cheapest ones we could find, we showed the children how to pull them and shout bang so the noise did not come as a surprise, we practiced wearing hats and reading jokes, all the basic skills needed for when Christmas arrives. We would have activities where the children sat at the table with candles, starting with the little battery operated tea lights until we established the no touching rule, then graduating to real candles safely supervised. his was done gradually over time so it was not overwhelming and sometimes the children got one or two of the ideas needed but not all, never mind there is next winter term to practice again. It is about creating the best chance for the child to build the joyful engagement in whatever the seasonal rituals and routines are by giving them the chance to learn them one at a time rather than – BANG! – all in one go on Christmas Day when so much else is going on. Food and dietary preferences that are more complicated than just not liking sprouts and of course sometimes both! These problems are usually much easier to cope with in the privacy of the family home but Christmas does tend to be more exposing with relatives and friends frequently part of shared meals and celebrations. This can increase the stress for everyone!! Sometimes people are very free with their opinions about how a child should behave at mealtimes and about what makes a good diet and this can make things even harder to deal with. It does help to be practical and realistic. If your child only sits at the table for five minutes every other day of the year then that is what they will do on the day. Likewise, if actually they never sit down at all or sit for as long as they have food they like, these too are what to expect on the day. Unlike typically developing children, autistic children are unlikely to ‘pull it out of the bag’ and behave in ways they don’t usually for a special occasion, so this kind of optimism is likely to lead to disappointment. If you are eating with other people in their house, and your child has no intention of sitting at their table, it helps to explain this well in advance. Many people just don’t understand and if given the chance to help will do so as long as you can be clear and up front. Perhaps ask for the child to be sat next to you in a place they can easily get down from, providing you are in a safe space overall. Then provide the child with access to whatever will keep them occupied whilst the rest of you eat and enjoy the meal. This may mean you take it in turns to supervise but this can be less stressful than a long wrestling match in front of other people! In the future you can aim for a bit longer at the table, mealtime skills can be worked on gradually at home and maybe next year… If your child has a limited diet and one that doesn’t include the full plate of meat and vegetables, with all the trimmings, there are going to be problems. Again, it is easier if this is thought through in advance. It helps to explain well before the day that the problem is not one of being a bit fussy, but more like an eating disorder that can occur with autism so. If your child will eat some part of the meal – great! – just expect that to be what happens. If they won’t eat any of the food, or insists on a particular plate, cup, spoon, etc, then provide the cutlery, crockery and familiar food so that some calories go down and the child is able to join the party briefly or successfully for a bit. It’s all a question of working from where the child is now with their food and planning to make is as successful as possible. With forewarning, most people recognise this is something special and they won’t take offense that a child doesn’t eat what has been prepared. A little success is much better than a melt down and a row that spills over into heated discussion among the adults. In one family I know they give the child his very individual meal before they go to the grandparents and the child joins the family at the table when it is time to pull the crackers. It is a huge success and the fact that he is not eating the same as everyone else has been gradually accepted over the years. Who knows, maybe the child will sit with his food at the table at the same time as the others next year – and the year after that have go at a sprout!